As a tribute to No. 6, Stan Musial, I’m posting a different historical photo of the greatest Cardinal each day for six consecutive days, Jan. 21-26, 2013. Musial, 92, died Jan. 19, 2013. Each photo is a copy I have collected from a library or archive. 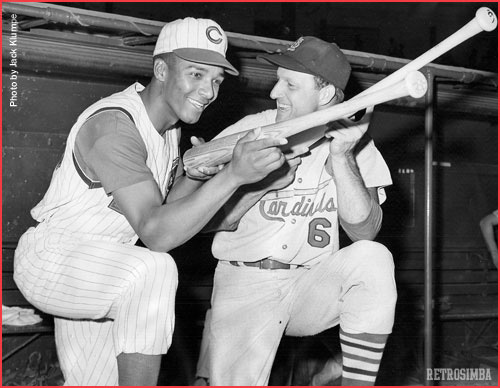 In September 1963, Musial helped Reds outfielder Vada Pinson, left, set his sights on achieving 3,000 career hits. Pinson, who led the National League in hits that season, finished his career with 2,757. Musial ranks fourth all-time in hits, with 3,630. Only Pete Rose (4,256), Ty Cobb (4,189) and Hank Aaron (3,771) have more. Musial collected more total bases (6,134) than any left-handed batter in major-league history. Only Aaron (6,856) has more career total bases than Musial. Next: 50 years ago, Stan Musial’s playing career ended at 42. Thanks for your comment and for reading my work. If you type in Ted Simmons in the Search area on right side of home page and click Search, it will take you to the articles on Ted.